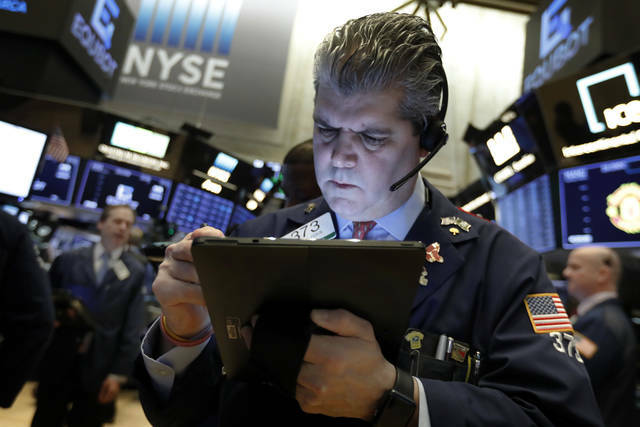 NEW YORK (AP) — Wall Street capped a day of mostly listless trading with a mixed finish Monday as gains in industrial companies, banks and energy stocks outweighed losses elsewhere. A surge in sales at Tim Hortons helped lift quarterly earnings for parent company Restaurant Brands. The company, which also operates Burger King, posted quarterly profit that topped Wall Street’s forecasts. The stock added 2.1 percent. Tesla got a boost from Canaccord analysts, who upgraded the stock from “Hold” to “Buy.” The analysts noted that results for the last two quarters and the electric car maker’s outlook have removed “significant concerns” about the production and profitability of the Model 3, the company’s car designed for the mass market. Meanwhile, LMC Automotive estimated that the Model 3 was the top-selling luxury car in the U.S. last year, outselling the Lexus ES by more than two to one. Shares in Tesla gained 2.3 percent. The Mexican-food chain is still rehabilitating its image years after a series of food-borne illnesses scared away customers and drove sales lower. Chipotle shares rose 3.5 percent. Loews’ latest quarterly results put investors in a selling mood. The commercial insurer tumbled 6.1 percent after it booked a fourth-quarter loss due to higher catastrophe losses. Activision Blizzard shares sank 7.6 percent following a Bloomberg report saying the video game company plans to announce layoffs on Tuesday, when it’s scheduled to report quarterly results. The report, which Bloomberg posted late Friday, cited unnamed people familiar with the matter. Shares in rivals Take-Two Interactive and Electronic Arts took a beating last week after the companies gave investors a weak outlook for the current quarter. On Monday, Take-Two slid 3.8 percent. Electronic Arts, which recovered Friday on strong sales of a new game, declined 0.4 percent. U.S. benchmark crude fell 0.6 percent to settle at $52.41 per barrel in New York. Brent crude, the standard for international oil prices, dropped 1 percent to close at $61.51 per barrel in London. Bond prices fell. The yield on the 10-year Treasury rose to 2.65 percent from 2.63 percent late Friday. The dollar rose to 110.40 yen from 109.77 yen on Friday. The euro weakened to $1.1276 from $1.1324. Gold fell 0.5 percent to $1,311.90 an ounce. Silver lost 0.8 percent to $15.69 an ounce. Copper dropped 0.7 percent to $2.79 a pound. In other energy futures trading, wholesale gasoline slid 1.9 percent to $1.42 a gallon. Heating oil declined 0.8 percent to $1.89 a gallon. Natural gas rose 2.3 percent to $2.64 per 1,000 cubic feet.